The Annual General Meeting of the Friends is due to be held on Thursday 19th October at St Ethrelda’s Church Hall, corner of Fulham Palace Road / Cloncurry Street. Doors open 7:30 p.m.
Our first guest speaker this year is: Peter Eversden, MBE, Chairman of The London Forum. The London Forum represents the views and interests of amenity and civic societies in London and their members on issues that are important for the living and working environment of Londoners, particularly in the fields of Town Planning, Development Management, Heritage, Transport, Infrastructure, Waterways and Open Spaces. Our second speaker is Seam O’Loughlin from Fulham Football Club who wills speak on their planning application for the Riverside Stand. Congratulations are in order as Bishops Park wins Green Flag Award a for a second time. For the second year running, Bishops Park has won the Green Flag Award for park quality. This award is judged on eight strict criteria, including horticultural standards, cleanliness, sustainability and community involvement. This is due in no small part to a number of dedicated people, including local residents ensuring standards are maintained, Quadron and Council workers who have all made a significant contributions to the retaining of the much sort after Green Flag Award. 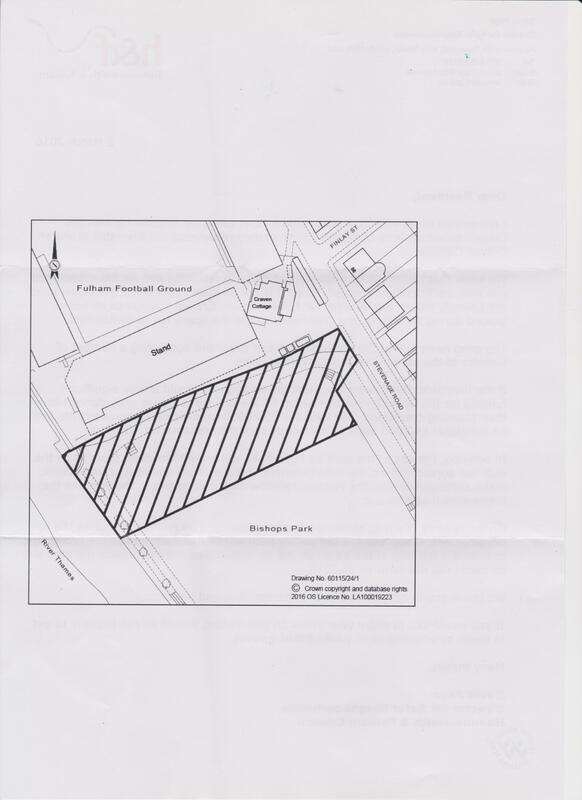 The Friends of Bishops Park have been having ongoing dialogue with H&F Council, Fulham Football Club (FFC) and the Church Commissioners about the development of the Riverside Stand and the partial use of Fielders Meadow for a two year period as a site to store materials etc. whilst this development takes place. There have been many questions around whether this is an appropriate use of the park, even for a temporary period. Whilst many residents have expressed their concerns we have tried to have then addressed by the relevant parties and have sought assurances that any damage to the fabric of the park is dealt with once the works are completed. There are significant financial incentives attached to FFC leasing this part of the park which is separate to the S106 money attached the approved planning application. The Council’s Arborist will be dealing with the trees issue i.e. removal of and pollarding of trees. Any trees removed will be replaced 2-1 in the area where they have been removed. Agreement with FFC to appoint a point person with whom residents can liaise in the event of any issues; name and contact details to be provided in due course. The Friends are also in discussions with the Council / FFC to ensure the hours of work and noise, especially relating to pilling work, will not adversely impact on the local community. Please see the residents letter and map for further information. Photos of events in the park can be seen in our photo gallery. Check it out as new photos are being added with new events in the park. Or join us on Facebook! Check out the Bishops Park page for all the latest news on events in the park. A petition has been raised asking The Prince’s Trust to reconsider the decision to sell Fairbridge Garden Centre to Pets At Home. Check out the petition for more information. A Friends of Fulham Palace Garden Centre Facebook page has also been created. 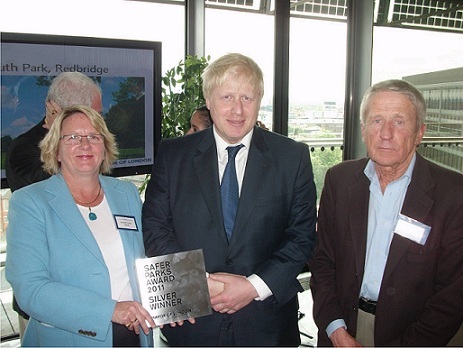 Amanda Lloyd-Harris, Chairman of the Friends of Bishops Park and Palace Riverside Safer Neighbourhood Panel accepted the London Mayor’s Silver Safety in Parks Award from Mayor of London, Boris Johnson on Friday 13th May 2011 at City Hall. This is a new award that judges the capital’s parks and their relative safety. The London Borough of Hammersmith & Fulham received two Silver Awards with the other going to South Park. Bishops Park is currently undergoing extensive redevelopment having been awarded nearly £8m from the Heritage Lottery Fund and H&F Council to restore the park back to its former glory. The works will also include improved facilities and equipment for toddlers up to teenagers. ‘During this time the Parks Constabulary has been an ever increasing presence to ensure that safety is still their number 1 priority’. The works should be finished in late September. The Friends of Bishops Park have signed up to the Green City Bats scheme, for further information on the scheme and how you can get involved please click on the logo below.